a week after the presentation the brand issued 500 advance orders of the new vehicle in a total of $ 40 millions. According to jalopnik.com, a car presented at the Motor Show, is a preproduction prototype of a model. Probably a commodity version of electric crossover will get other trim materials of the interior and slightly different exterior design details. The crossover is constructed on a sedan Model S platform which is also shared a propulsion with the new car. This model X is equipped with another motor driving front wheels in addition to an electric motor mounted on the rear axle (output 362 or 410 horsepower). According to Tesla, Model X accelerates from 0 to 96 km/h in 5 seconds. It takes 4.4 seconds the charged vehicle. The declared distance with a fully charged battery is almost 430 kilometers. The front doors of a crossover are opened in the traditional way but the rear doors are “gull wing” type although Tesla calls them “falcon wing” emphasizing that the opened doors are completely under a car without requiring any space on the sides. Tesla engineers affirm that for opening their “falcon wings” require even less space than sliding doors of minivans. Tesla Model X has seven seats arranged in three rows and the two trunks. One of them is located under the hood, where gasoline vehicles have an engine. There is an electronic instrument panel and a very large vertical pad on the center console in the electric crossover interior. Thus, all systems of the car have completely touch control. The cost of Tesla Model X crossover in the series will be nearby 30,000 dollars. 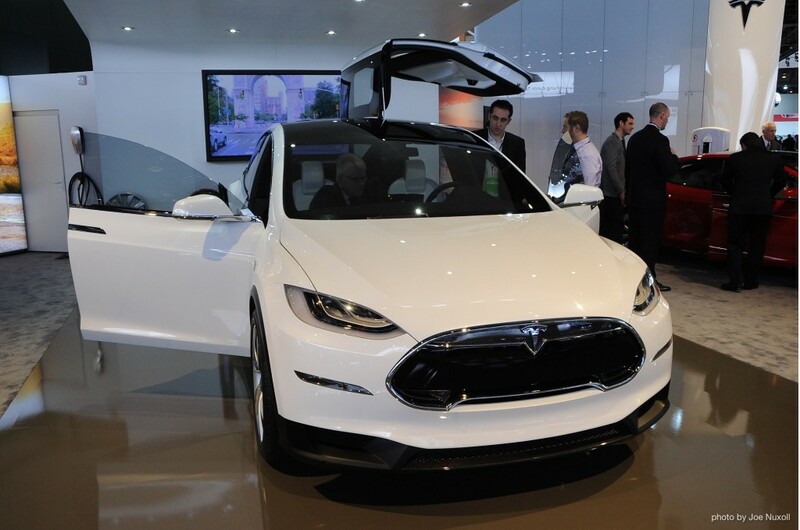 Its assembly will be begun at the end of 2013 at a factory in Fremont, California, and the first owners will get their Model X in 2014. BMW working on Tesla Model X rival?